So we’ve had QR codes and location based services for some time now in the tech and social industry – and since Apple introduced their iBeacon (although this tech has been around for a while too) – we’re entering new territories as marketers and customers. What are iBeacons you ask? Imagine being able to send messages to consumers more contextually. For example, if your brand is trying to target consumers at a venue for an event; you’ll be able to know they’re there and send a message through your brand app to them automatically. Not only is this awesome, but it’s convenient for the consumer too. Why is location so important? It creates the contextual relevance for advertising that otherwise isn’t already there. For example, being at a concert when you get an advertisement for a discount on food located at the venue is way more useful then getting that advertisement on a random day. It is then useful, easy to use, and actually relevant to that person. Imagine your target consumer is parking at a large mall. You already know they have an intent to purchase, and now you can target them accordingly right through the device that is already at their fingertips. They’re probably already thinking what deals can I snag while I’m here – the mindset is there; the location is there; and the context is there. What I think is even cooler? 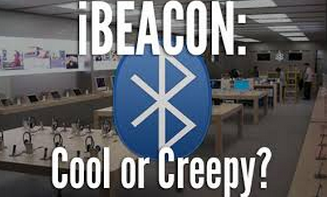 Sending messages or showing different visuals to a person as they walk by a display due to the iBeacon. For example, if someone sees a product they may like, perhaps they get a real-time demonstration of it right then and there. What if Blue Tooth is not enabled? Unless the consumer is an early adopter and really into tech like this (as marketers like myself are); adoption will be slow. Privacy is still a rampant issue that many consumers face and tech like this make some uncomfortable. I see this technology growing rapidly and taking shape in many apps and devices. However, I see mainstream adoption not truly occurring until 2015, when more people grow comfortable with this type of location and contextual detection within apps and devices. This entry was posted in Brands, digital marketing, technology and tagged Apple, BLE, bluetooth, digital marketing, featured, ibeacons, location based marketing, marketing and technology, real time marketing, Social media, socialnomics, technology by Pam Sahota. Bookmark the permalink.